Prospectors were attracted to the Canada del Oro region by the lure of gold in spite of the risks from the Apaches. Reports of placer mines established along the upper reaches of the “Canyon of Gold” continued until late in the 1920s. Apparently not much materialized since no mining activity has been found in Park area. The most successful enterprise in the general area of the Park was ranching. The earliest known rancher within the Canada del Oro region was Francisco Romero who was born in Tucson between 1810 and 1831, the grandson of a Spanish soldier who had arrived in Tucson in the 1770s. 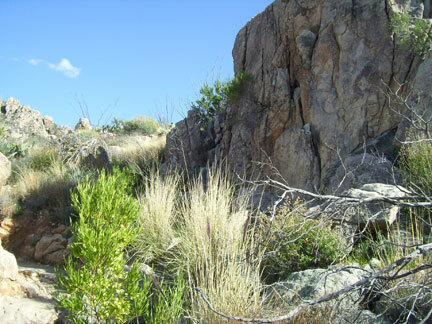 Although little is known of his childhood, he is mentioned as establishing a ranch of 160 acres on the west side of the Catalina Mountains in 1844 near the Canada del Oro. Romero evidentially was a successful rancher, since he acquired additional pieces of property including 320 acres of farmland along the Santa Cruz River west of Flowing Wells and land on Main Street in the downtown Tucson business district. Francisco and his wife, Victoria, had three children, one of whom became a rancher. His name was Fabian, born in 1864, and he is credited as the founder of Rancho Romero. His ranch is reported to have been 4800 acres. According to a map of Pima County drawn up in 1873, the Romero Ranch buildings were shown as located in section 4 that is within the Park boundary. A capped well and a concrete base for a water storage tank are the only remains that were found at that location. Fabian and his wife, Benardina had five children but it is not known if any of the children took ownership of the ranch before it passed out of family ownership. Romero Pass and Romero Canyon were named after the family. Another rancher to follow the Romero family to the Canada del Oro region was George Pusch, a young German immigrant and his partner, John Zellweger. They bought a large ranch in 1874 that was later named the Steam Pump Ranch due to the installation of a steam pump to ensure a predictable water supply. Pusch died in 1921 and the cattle ranch passed out of the family’s possession. The Sutherland family also ranched in the vicinity of the Canada del Oro Wash. William Henry Sutherland was the general superintendent and part owner of the Arizona Stage Company. Later, he purchased the Canada del Oro Ranch. According to the 1922 Pima County Highway Department map. The Sutherland ranch house was located in the northwest corner of Section 26, which lies within the central section of the Park. The Sutherland Wash, the major tributary of the Canada del Oro Wash that flows through the Park, was named for this family. The history of the Park land is uncertain from the 1920s until the 1940s when J.E. McAdams purchased 4100 acres that he called Rancho Romero. His property is believed to contain parcels that had been owned by the Romero and Sutherland families. The McAdams family owned the land until 1971 when it was sold to Ratliff, Miller and Muhr Investments, Inc., who developed the plan to convert the ranch into a self-contained community. This plan was given the Pima County Planning and Zoning with the request to rezone the land. Return to Catalina State Park Index. (Above) Entrance to the Catalina State Park trail head where most of the trails separate. Use the video controls to play the video looking southwest to northwest towards Tucson. Video of Catalina State Park in Tucson, Arizona. The Park is open for hiking, camping, horseback riding and picnics. 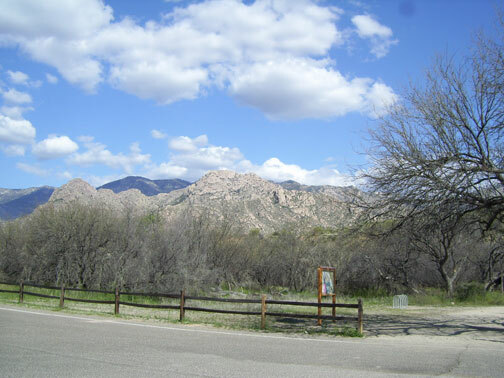 The Catalina State Park campground and Canyon Loop Trail is nearby. Photos and videos by R. Zucker © 2009. © 2010 EMOL.org / Tucson Entertainment Magazine On Line. All rights reserved. Free Shipping on Several Top Products at Camping World! Shop Now!